The Hope College men’s and women’s soccer teams are giving an assist to local youth with the help of Zeeland Family Dentistry and USA Soccer. Every time the Flying Dutch or Flying Dutchmen play a home game at Van Andel Soccer Stadium, two USA Soccer teams are special guests at Hope. They walk out onto the field to join Hope’s teams for the National Anthem. 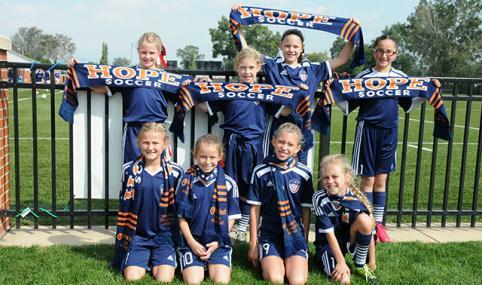 They receive a gift sponsored by Zeeland Family Dentistry; this year it is a blue-and-orange Hope Soccer scarfs. Chris Hofland (’95) of USA Soccer called the partnership, which is in its fifth year, a great one that benefits local youth. He appreciates the support from Kevin Rebhan (‘84) of Zeeland Family Dentistry. It is a rewarding time for Hope’s players, Rebhan said. Rebhan watched his daughter, Rachael (’14), take part in the program as a member of the Flying Dutch for four seasons. The relationships go beyond Hope’s soccer seasons. The Flying Dutch and Flying Dutchmen work with USA Soccer players during the USA Soccer season. “Every June, we have Hope men’s and women’s soccer players come to our tryouts for two nights,” Hofland said. “They execute our tryouts, so our coaches can observe and evaluate players. They don’t have to worry about running drills.